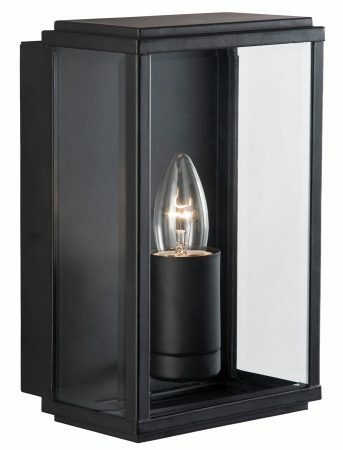 This outdoor box wall lantern in matt black finish with bevelled clear glass panels is rated IP44 , simple, traditional and elegant. Featuring a rectangular box design, with candle style lamp mounted on the wall plate and clear glass panels on the front and sides for a bright all-round light. The sleek black metal box is enhanced by the clear glass and visible candle style light fitting. It’s perfect for lighting your outside walls, is IP44 rated, fully splash proof to protect against the elements and looks great alongside your front door or illuminating a walkway or patio area at night. If you are searching for a traditionally styled exterior light, this fitting should be considered. Fully weatherproof and supplied with a manufacturer’s 3 year anti corrosion warranty, which relates to the corrosion of finishes on outside lights like this one. Locations within 5 miles of the coast are excluded. Supplied by Searchlight who manufacture some of the best traditional and modern classic designs such as the outdoor box wall lantern in matt black finish with bevelled clear glass panels and rated IP44 you see here.